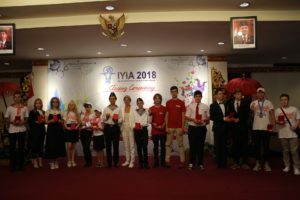 Russian students won 12 gold and 5 silver medals at the 5th International Young Inventors Award – IYIA 2018. Grand Prix with a cash prize was received by Alexander Dudkov from Nizhny Novgorod, a representative of the Nizhny Novgorod Children’s Shipping Company, for the project of “Sail-Wing”, a robotic ship model for autonomous monitoring of water areas powered by wind and sun . Gold medal was awarded to another Nizhny Novgorod student – Vladimir Krupa for the Eco-Boat project: autonomous vehicle to collect garbage from the surface of the water areas. The International Young Inventors Award was held in Indonesia on September 19-22. More than 300 schoolchildren and students from 15 countries took part in the exhibition. Russia was represented by 17 inventors aged 6 to 19 from Moscow, Nizhny Novgorod, Norilsk, Kazan, Chita, Ufa, Monchegorsk, Sarov and other Russian cities.